This day-long gathering brings together high school history students, their advisers, and social studies department chairs from the following Rockland County high schools:? In addition to addresses from historians and dignitaries, the students will prepare presentations for their peers on themes related to Rockland County history of the past 50 years. The keynote speaker at this year's conference is the Honorable C. Scott Vanderhoef. Participation in and attendance at the conference is by invitation only. 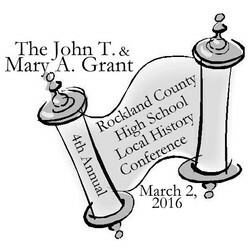 For more information about the Rockland County High School History Conference, contact Education Coordinator Richard Donegan at (845) 634-9629 or educator@rocklandhistory.org. The Historical Society of Rockland County is a nonprofit educational institution and principal repository for original documents and artifacts relating to Rockland County.? Its headquarters are a four-acre site featuring a history museum and the 1832 Jacob Blauvelt House in New City, New York.